We call it Big Danish Energy. That’s the phrase that Badlands Journal creative director Rohan Peterson came up with when he, Badlands Journal editor Talisa Sutton and I were all together in Copenhagen last month. It’s a good play on words, right? But it also seems to encapsulate the innate, fizzy energy that is being Danish. It was everywhere we looked in the city, right in front of our noses. It was the girls riding their bikes in billowing cornflower blue Ganni dresses, ankles festooned with shell bracelets. It was there in every pair of Havaianas thongs on every pair of legs crossed at every table at the see-and-be-seen Nyhavn spot Apollo bar. It was there in the cabinets at boutiques Lubarol and Lot 29, where each shelf was full of delicate bedazzled barettes in shades of pistachio green and lemon yellow. Big Danish Energy is more than just a style, though. It’s a mood, a quiet confidence, an atmosphere of taste and coolness and wit. It’s not chic, per se. Big Paris Energy, for example, is something completely different. No, Big Danish Energy is a little bit wrong. Which is what makes it so right. 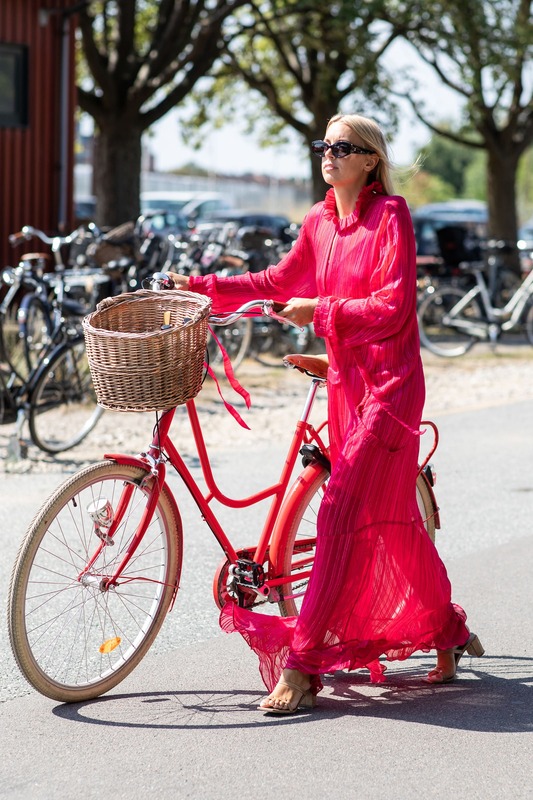 If you want to look for Big Danish Energy in the wild you need to zero in on Copenhagen Fashion Week. Spread like a julienned avocado on smørrebrød across just three days, it’s a joyful, unbridled ode to the country’s fashion industry, worth an estimated $2.4 billion in 2018. We’re talking about brands like Ganni – the undisputed coolest cool girl of all the cool girls of Danish fashion – yes, but also Baum und Pferdgarten, Stine Goya, Saks Potts, Cecilie Bahnsen and Malene Birger, the elder stateswoman of the industry. But the real Big Danish Energy was to be found off the runway and on the streets where Copenhagen’s gaggle of influencers reigned supreme. Led by Pernille Teisbaek, who has since traded in her fashion blog to helm a booming social media marketing business, street style favourites including Jeanette Madsen, sustainable fashion advocate Cecilie Thorsmark and Emili Sindlev were some of the best dressed women of the week alongside overseas names like Lucy Williams and Laura Jackson who jetted in for specific shows. They wore bike shorts, tangles of gold necklaces and yellow-tinged sunglasses. They wore bright, colourful gowns, billowing all-white ensembles and tops fashioned out of silk scarves. They wore baby pink everything, clutched handheld fans and little beaded Fendi baguettes and Dior saddle bags. All of this should come with a warning: Do not try this at home. We should know. While in Copenhagen last month Talisa and I were caught up in the whirling dervish of Big Danish Energy. 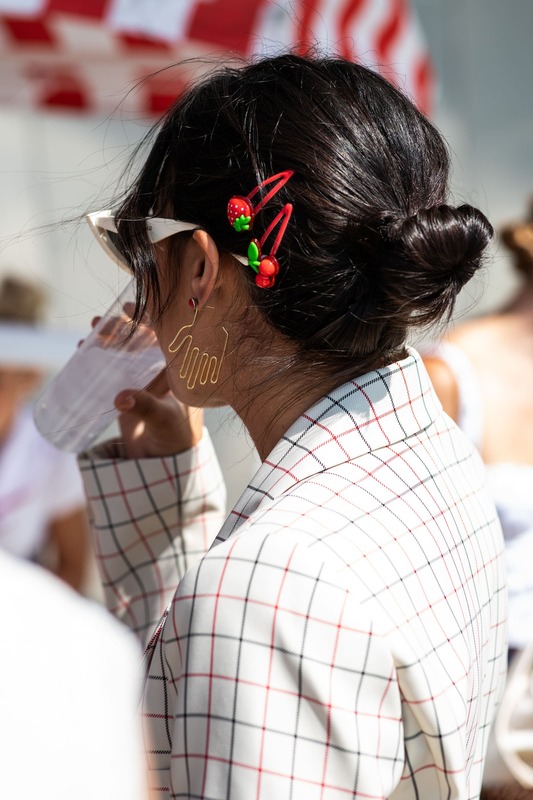 I bought scrunchies by the armload and wrapped them into my hair – they’re mad for scrunchies in Copenhagen, too – and on our last night we had dinner at Baest, the city’s coolest restaurant, in Ganni midi dresses in ditzy floral and oversized check prints. I’ve tried to parlay some of that Big Danish Energy into my life back home in London but it’s not quite the same. Multiple jolts of gingham in one outfit look silly here, against a backdrop of historical buildings and pubs. That check dress, which looked so painfully cool in Copenhagen, feels wrong, somehow anywhere outside of that city. My advice, as someone who has been channeling Big Danish Energy with varying degrees of success for several years now, is to start small. Buy some barettes. Wear some pearl earrings. Get a little bit hygge with it. Once you graduate from novice to apprentice then you can think about the more difficult ensembles, like rubber Havianas to the office or a mustard paisley two piece. If you can master that, young Padawan, then you can tackle the biggest Danish energy of all: Bike pants as shorts. Good luck. We salute you.